I pick up my cell phone and punch in the numbers. “Rob, would you please ask Joe to stick his head out of the window? I’d like to get a picture.” We left the house at the same time, but we took separate cars. He is taking the boys to school, and I am going straight to the office. I grumble a bit, feeling like a child being scolded by a parent. “Okay, fine. Thanks anyway.” I say. My insides ache, as the unattainable photo opportunities mock me. 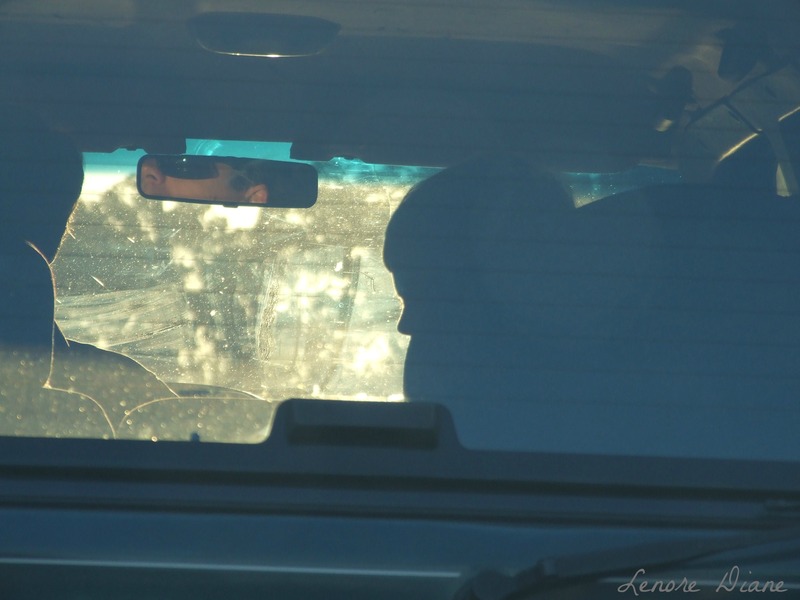 Then I notice Charlie’s profile outlined by the sun, and Rob’s sunlit face reflecting in the rear-view mirror. With the cars stopped, I use the zoom lens to bring the subjects closer, and I quickly take my shot. Before the cars move again, I place my camera back in the camera bag. The child in me wins again. We need to get you one of those cameras in a pen gadgets…like a spy. So you can take pics on the sly. Oh the damage I would do with a spy camera. I think I was born to be part of a paparazzi team. Shhhhh…. You caught a moment in time that no one else saw, and would have been lost forever. Thank you, Charles. I like the fact that I caught this moment. It was as if I was the proverbial fly on the wall. Kinda neat. Oh, to be fly on the wall when you showed the picture to Rob. Reminds me of when my “former” boyfriend would yell at me for documenting our long bicycle rides…while pedaling. Sheesh. Why not?